Who knew that Earth had a Sorcerer Supreme protecting it from outside magical and supernatural threats? Or that Marvel still remembered how to produce a straight-up origin story without feeling the need to overpopulate it with Marvel Universe heroes and villains? 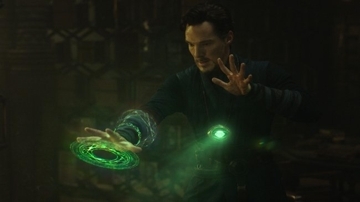 Some fans accustomed to crossover confusion may wish for a more complex plot than we get in Doctor Strange, but I find it refreshing to be able to focus on a single character’s journey from supreme jerk to Sorcerer Supreme. Benedict Cumberbatch might not fit the leading man profile, but he wears the Doctor Strange uniform well. In the early going he’s especially perfect as an arrogant neurosurgeon who has a career-ending accident and, embittered, travels to Nepal to seek a mind-over-matter healer that would help him get his career back. As is often the case in life, when one door closes, another one opens . . . only this portal opens into the astral dimension and time-space continuum. 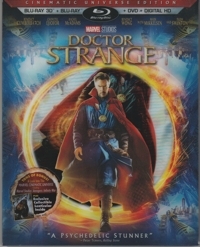 Doctor Strange looks great in standard Blu-ray, but if ever a film was made for 3D, it’s this one. Unlike some 3D movies that look as if the filmmakers occasionally threw in some effect so it looks like it’s flying at you, Doctor Strange features mostly remarkable depths of field in plot-grounded scenes that are so mind-bending it’s hard to describe. As the sorcerers do battle they rearrange buildings, roads, and whole cities as if they were Tetris blocks, turning them sideways, upside down, and creating fields of battle that keep shifting. Amazingly, it only seems to shift for those in attuned to the supernatural. Streets and cars and people seem to carry on even as their world is turned sideways or upside down. In 3D it’s especially “marvel”ous, though it’s still pretty awesome on 2D Blu-ray. All superheroes try to save the world. It’s in their contract. But the crisis usually isn’t of their own making, as it is in Avengers: Age of Ultron. The sequel to 2012’s The Avengers is a slam-bang action and special effects movie that requires you to pay attention to pick up the plot points—which means that family members on the low side of the PG-13 rating might be slow to figure things out, though they won’t care a bit. They’ll be happy enough savoring the breakneck action and appreciating the CGI antics of Thor (Chris Hemsworth), Hawkeye (Jeremy Renner), Iron Man (Robert Downey Jr.), Black Widow (Scarlett Johansson), The Hulk (Mark Ruffalo), and Captain America (Chris Evans). In the pre-title sequence, the Avengers raid a Hydra stronghold in a fictional Eastern European country and recover Loki’s scepter that Hydra scientists were using to experiment on human subjects, including a pair of twins—the now superfast Pietro and mind-manipulating Wanda. But what viewers can see that the Avengers can’t is that Hydra actually wanted them to take that scepter, knowing its power for evil and Tony Stark’s all-or-nothing personality. Thor is anxious to return the scepter to his world, but trouble ensues when Stark (aka Iron Man) borrows it to upload into his global defense program, dubbed “Ultron,” and the scepter A.I. 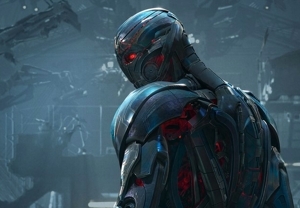 causes Ultron to go full-blown evil. He eliminates Stark’s A.I., J.A.R.V.I.S., and, like all non-human intelligences, looks around and decides that the world would be a better place without so much bickering flesh and blood. The rest of the film follows the Avengers attempts to track him down—which means a return trip to fictional Sokovia and some pretty cool all-out battles. I’m giving this an A- only because the special effects are uneven. That long pre-title sequence incorporates shortcuts—sped up shots, wildly sweeping cameras, and quick cuts—to generate the appearance of furious action. Thankfully the rest of the film is mostly devoid of those cheap tricks, and viewers can “marvel” at the action as it plays out. In Avengers: Age of Ultron the characters Hawkeye, The Hulk, and Black Widow get more development, and Samuel L. Jackson returns as Nick Fury, but only for the third act. 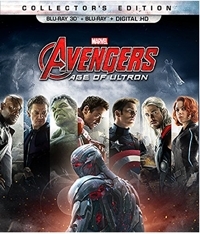 Ultron is the star of this show, and he’s villainous enough to pull the very best out of the Avengers. Some viewers might have flashbacks to the 1999 remake of The Mummy, in which an evil one tries to “upgrade” himself from walking skeleton to fully flesh-and-blood villain, because the same thing holds true for Ultron. The opening sequence might also remind viewers of the Star Wars series—particularly the speeder bike sequences from Return of the Jedi—because, even more than the first Avengers film, this one goes full-bore CGI in action, backgrounds, settings, and objects. But it’s accomplished and it’s as entertaining as popcorn movies get. Because of the complexity, because of the accomplished special effects, it’s a film that ought to get plenty of repeat play. The collector’s edition comes with 3D Blu-ray, Blu-ray, and Digital HD, with more than 45 minutes of exclusive bonus features. The DVD is sold separately, but Blu-ray is the way to go, mostly because the sound is so amazing. The picture has plenty of pop, but it’s the immersive soundtrack that sells it. And if you have 3D capability, the depth and tracking during quick scenes is pretty amazing. Takeaway: Marvel and Disney are inching closer into Star Wars territory, and creating a series of movies with just as many connections and complexities. 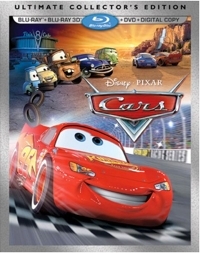 Cars begins in a surprisingly generic way, with a big race (the stuff of Saturday morning cartoons) ending in a three-way tie between two veterans and a cocky rookie named Lightning McQueen—the winner to be determined by a tiebreaker that will be held in California a week later. McQueen is totally self-absorbed, so it’s no shock that he pushes his personal big rig, Mack, to get him there overnight . . . and it’s no surprise that the audience is instantly delighted that he gets an early come-uppance when Mack (John Ratzenberger) falls asleep and, startled by a bunch of highway hotwheels, accidentally dumps his dozing cargo in the middle of nowhere. Though the Disney’s acknowledged Golden Age of animation began in 1938 with Snow White, seven dwarfs, and Nine Old Men—the original team of animators—the studio’s 1989 production of The Little Mermaid launched what could only be called a second Golden Age. Disney’s 28th animated feature broke new ground by infusing the narrative with Broadway-style songs from composer Alan Menken and lyricist Howard Ashman, whose music theater work included Little Shop of Horrors. The two brought a new energy to Disney animation—it was Ashman’s idea to turn the crab in the screenplay from an English butler type to a Jamaican Rastafarian—and directors Ron Clements and John Musker had a budget to work with that was larger than it had been in decades. But it’s all in the details, and Disney really ramped up the animation and backgrounds to create an undersea world that was nothing short of spectacular. That successful formula would also be used in Beauty and the Beast two years later, and in The Lion King (1994). 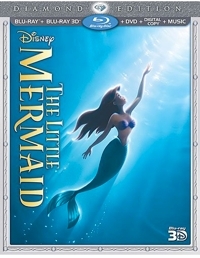 Broadway actress Jodi Benson was chosen to play Ariel, and she brings a wide-eyed innocence and passion to the role—and to Ariel’s signature song, “Part of Your World.” Each song moves the narrative and character development forward, with several big production numbers so rousing (and with characters assuming “Ta da!” poses at the end) that many theater audiences burst into applause. When Wreck-It Ralph and Brave came out of Disney-Pixar studios last year, it felt like a case of babies being switched at birth. But it really WAS the Pixar gang that produced Brave, a princess fairy tale with a traditional, realistic look to it, while Disney animation gave us Wreck-It Ralph, a spunky homage to video games that depicted multiple virtual worlds. For gamers, the fun comes from spotting allusions to such popular and historic video games as Super Mario Bros., Q*bert, Street Fighter, Pac-Man, Paperboy, Pong, Dig Dug, Qix, Frogger, BurgerTime, Sonic the Hedgehog, Metal Gear, World of Warcraft, and Altered Beast. 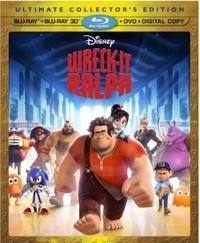 But you don’t have to be a gamer to enjoy Wreck-It Ralph. The premise is similar to Toy Story. Once the lights go out, the “toys” (here, characters in a video game) are off-duty and have a life of their own. It turns out that acting out these video games is their day job, and there’s a transportation terminal that takes them to and from their games at the Arcade. 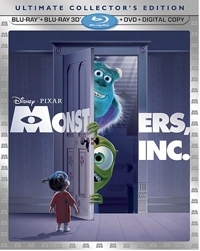 Not many people have 3D TVs, but there’s reason to pick up a copy of Monsters, Inc. on 3D Blu-ray even if you’re not equipped to watch with those funny glasses just yet. For this release the fourth Pixar animated film got an audio makeover—even the standard Blu-ray—and the English Dolby TrueHD 7.1 is a considerable upgrade over the previous Blu-ray and DVD.